David Ogletree ’85, one of the last organ students to study organ performance at UMass Amherst, is bringing the instrument he loves into the future. While he was a UMass Amherst music student, David Ogletree ’85 found offbeat use for his spare time. He bought a broken down electronic Baldwin organ that was gathering dust in a campus warehouse, dragged the giant console up the stairs to his North Amherst apartment, and rebuilt it. Today, with his business partner, Doug Marshall, Ogletree is building a much different kind of organ. The digital instruments they craft at Marshall & Ogletree in Needham, Massachusetts, are pulling the venerable pipe organ into the 21st century and putting other electronic organs to shame. The pipe organ is a magnificent creation. Each one is unique, designed for the building where it resides. It is capable of producing a vast variety of sounds through thousands of pipes. Its mechanics are an incredibly intricate combination of a wind instrument and a keyboard instrument. In fact, no mechanism was as complex as the pipe organ until the advent of the telephone exchange, says Ogletree, a student of organ history as well as of organ music. It takes a maverick with both artistic and mechanical talents to move the organ forward. David Ogletree began to develop these talents and his passion for the organ as a boy in Westwood, Massachusetts, when he started organ lessons at age 11. His playing earned him a Chancellor’s Talent Award to attend UMass Amherst on a full scholarship. He was one of the last organ performance students on campus, studying with Ernest May, an organist and professor in the Department of Music and Dance. While at UMass, Ogletree also developed his audio know-how as a salesperson at Tech HiFi on North Pleasant Street. “Those four years were wonderful because I felt very free to explore my art and my craft,” he says. He went on to graduate study at the highly selective Curtis Institute of Music in Philadelphia. At a summer job at a stereo store, Ogletree met Doug Marshall, a fellow concert organist and audiophile who had studied with the renowned organist Virgil Fox. They shared an interest in making great organs more accessible, and after a time, formulated an audacious goal: to build organs that rivaled the best pipe organs in the world, but were digital in design. Recording sounds from 150 or more organs and configuring the technology for the digital organ was a long and painstaking process. 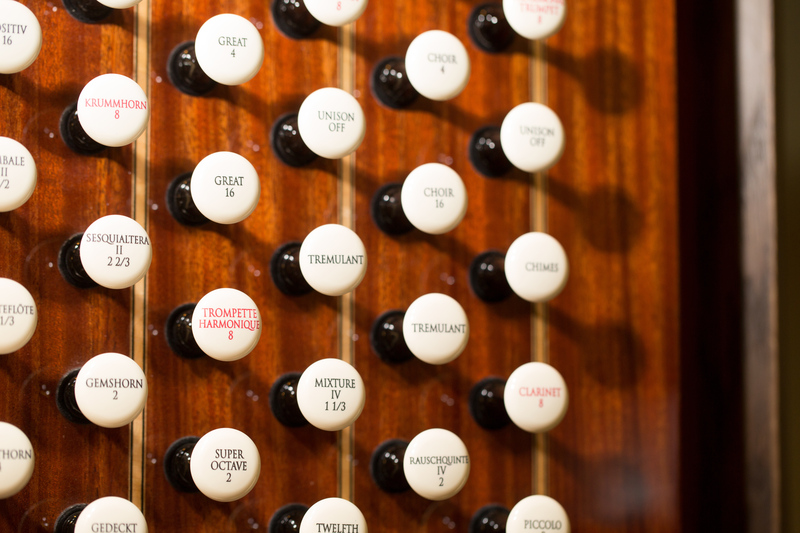 The first Marshall & Ogletree organ (Opus 1) was completed in 2003 for the historic Trinity Church in New York, which had been heavily damaged by the 9/11 attacks. The church’s daring decision to go digital was a success and more commissions—and technological improvements—followed. Marshall and Ogletree are currently at work on Opus 13 for a large church in Arlington, Texas, and on Opus 14 for a Greenwood, South Carolina, church. To further demonstrate the powers of the digital organ, he takes the short drive from the Marshall & Ogletree headquarters to St. Paul’s Episcopal Church, in Dedham, Massachusetts, the home of Opus 12. Ogletree sits at the oak console in St. Paul’s and plays. His hands fly over the three keyboards and pull out the stop knobs, his feet dance over the pedals. The music fills the church, moving from your eardrums and flowing through your entire body to the tips of your fingers and toes. The music varies from soft to loud, low to high, at one moment reminiscent of a trumpet fanfare, at another like the gentlest of bells. The digital organ commands the sacred space. For David Ogletree, this is the sound of a dream fulfilled. Stop knobs of a digital organ.